I love discovering new films at festivals and testing just how memorable a film becomes amongst so many more. So a month after Hot Docs, which films have stayed with me? This IDFA winner by Korean director Seungjun Yi is a beautiful love story of a deaf-blind poet and his wife. He is extremely tall and child-like; she is very short with a serious face. She uses finger braille to communicate with him. Her fingers were like butterflies liberating him from his silence. The film employs exceptional observational cinematography to capture those intimate moments and the way they share and experience the world. I was mesmerised and immersed in their world. Sundance award-winning Danish director Mads Brügger goes to extremes in order to expose how easily diplomatic accreditation can be bought in Africa for purposes of illegal trading. From setting up backroom deals with corrupt consuls and brokers to creating his own business in the Central African Republic, he takes us on an extraordinary journey of corruption and deception. There is a huge irony to this film: to be able to expose how power truly works, the director acts as the main character, and the film turns into a well-crafted black comedy that gets exponentially more dangerous the deeper he goes. We know from the beginning that he is not real – but the situation and the dangers are very real indeed. I would not normally go for such acting in documentary, but the ability to navigate between danger and comedy by making the audience an accomplice allowed the director to create various perceptions of reality within one film. Sweden had a very strong presence this year at Hot Docs, and the following are among my favourite films. 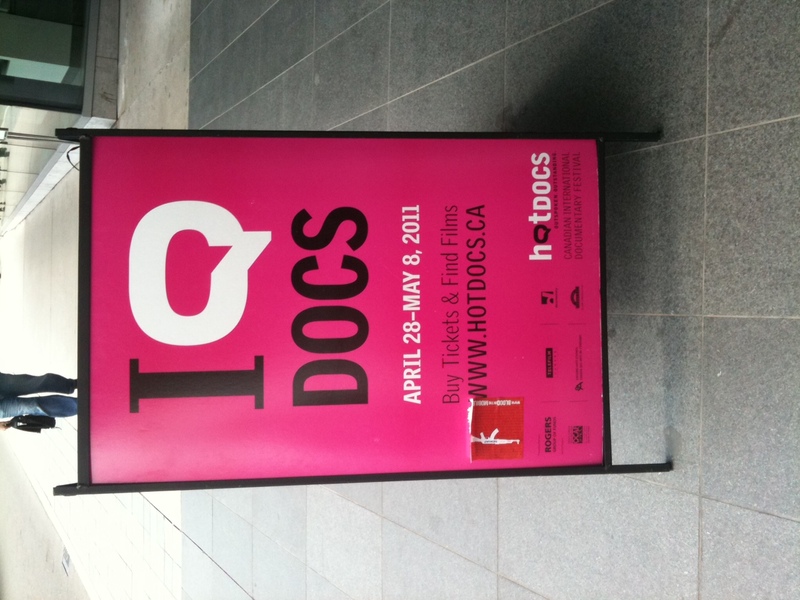 Hot Docs has an amazing and magical pull as a documentary festival that brings together filmmakers from all around the world – but more importantly, year after year, Hot Docs develops new ways of increasing their local audience. This year, they offered free screenings to students and anyone above 60, creating the most challenging, yet welcoming audience one could dream of. Toronto as a city is also exceptional, being littered with single-screen arthouse cinemas. Almost every neighbourhood has a their own non-commercial screen, making it one of the best in North America. Whether living in the East or West, Midtown, or down by Lake Ontario, Toronto cinephiles with their insatiable appetite for classic, foreign and challenging cinema are never likely to go hungry. And now the Bloor cinema is dedicated to documentary alone, can you believe this! Owned and operated by the Hot Docs festival, the theatre has been restored to its former glory, retaining its original 1913 architecture and its art-deco charm, but equipped with a great screen and the latest acoustic panelling to further enhance the viewing experience. Characters, subjects, participants, or just people? With our Interdoc programme we have been running some clandestine whisky tasting soirees at different festivals wherever we are running sessions. A special guest list is invited but only get to know the time and the place via a text at the last minute. Such evenings are good fun and great way of networking. Of course we also get a few gate crashers and this time, one of them was a woman who stepped straight out of a Vogue magazine, and when I enquired who she was, she replied “but I am Melissa, the star of Melissa’s film”. Funny enough the following day, American filmmaker David Wilson (True/False Film Festival), was questioning at the Soap Box event what should be the best or correct way to refer to our documentary subjects? If we had an award for "best audience" it would go to the city of Toronto. Every single screening at Hot Docs was packed with a crowd, which gave themselves over to the story on screen and lived through the roller coaster of emotions, laughter and tears. It was palpable. There was a ritual: Every screening started with a humoristic advert to celebrate and thank all the volunteers who make the festival happen. Everyone applauded.